Carry extra ammunition needed at your hip, on a vest or attached to a duty pack with the Blackhawk! SR25/M14 Single Mag Case. Engineered to offer silent and strategic magazine deployment, an open-top style utilizes a bungee retention system to eliminate the noisy opening common among hook and loop covers. 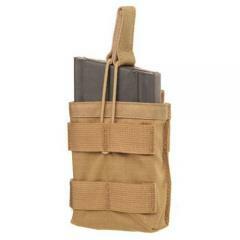 The pouch features a MOLLE 3700 series attachment system for total customization. For increased versatility, Blackhawk! employs an exterior S.T.R.I.K.E.® webbing system to allow for attachment of additional pockets or other compatible accessories. Constructed to withstand the extreme duress of ever-changing field conditions, the 500D ripstop nylon material provides superior durability while metal drainage grommets prevent damaging moisture build up. Dimensions (L x W x D): 4.3" x 3.14" x 1.25"